008: License to make analogue sounds. MUSIKMESSE 2015: British manufacturer Modal Electronics has made a big statement of intent by launching the 008, an eight-voice, 16-VCO and 16-sub oscillator pure analogue polysynth. This is powered by an entirely new analogue engine. Each of the eight voices features two VCOs (offering sawtooth, triangle, and square waveforms with PWM and noise) and two sub oscillators. The waveforms can be blended to create complex new wave shapes. The filter, meanwhile, offers 16 types and additional filter overdrive, while the filter envelope is said to be ultra-fast and can be assigned to any parameter. There are also two LFOs with multiple wave shapes. Other features include oscillator and filter FM and a modulation matrix, while there's also a 4.3-inch, full-colour, context-sensitive display. A sequencer and arpeggiator are in place, too, as is the option to control and edit the 008's functions from any HTML5-compatible browser. 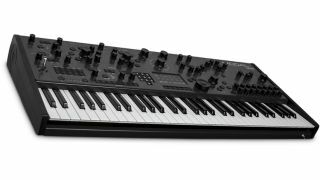 The synth has a solid steel chassis and comes with a five-octave Fatar keyboard. Full specs are below, and you can also find out more on the Modal Electronics website. The 008 is scheduled for released in the summer. Innovative and extremely flexible 16 multi-mode filter, consisting of traditional modes such as low-pass, band-pass and high-pass as well as more unusual notch, phase and combination modes.